How does dental insurance billing and coding differ from medical billing and coding, and why? Both medical and dental billing are very similar. They both rely on an in-depth understanding of the principles of billing and coding, as well as an understanding of how insurance companies receive, process, and pay claims. and how to communicate with insurance companies. Which coding books do you use? Unlike medical billing and coding, however, dental coding uses a different set of data to code and send claims. Medical coding relies on three main texts: HCPCS, CPT, and ICD-9. Dental coding, on the other hand, uses a text called Current Dental Terminology (CDT), which is published and maintained by the American Dental Association. This text was specifically created for dental insurance billing and coding. It has all the codes that you need to code and bill dental claims. 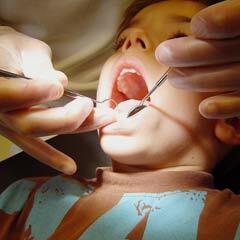 This is because each of the dental procedure codes is specifically related to a dental diagnosis. 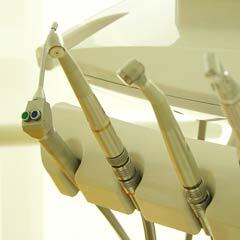 For example, the code D7240 is for full bony impacted wisdom tooth removal. This means that the procedure performed was related to the patient's dental condition, which is reflected in the procedure that was performed on the patient on the date of service. This means that a separate diagnosis code is not needed. Just like medical and hospital claims use their own claim forms, so does dental insurance billing and coding. The dental claim form is called J400. This includes a space for patient demographics and identifying information, patient dental insurance information, and dental procedure codes and dates of service. They also include spaces for information regarding provider identification, charges, and treatment location. 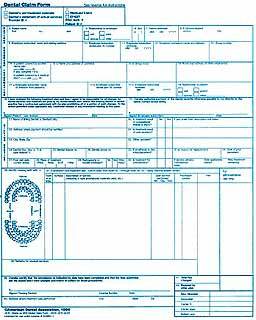 This is also similar to medical claims forms. All of this information is included when the dental hygienist or dentist performs the necessary procedures, and as such is indicated on the claim. Due to the fact that many dental claims require attachments such as radio-graphs and periodontal charts to prove medical necessity, over half of all dental claims are sent as paper claims in the mail. Although some dental insurance practice management programs do offer the option to scan and attach the necessary medical documents, they also come with a higher price tag. Not only is this type of software more expensive to buy and maintain, but it's more expensive to send these types of claims electronically than regular medical claims, for example. or the postage and time required to send paper claims. Dental insurance or medical insurance? Another important consideration for dental insurance billing and coding is the type of insurance company to which it is billed. This means that the patient must have dental insurance in order to receive dental procedures, just like they need medical insurance for medical procedures and vision insurance for vision procedures. If the patient doesn't have the correct type of insurance, then the insurance won't pay for any of the procedures performed and the patient will have to pay for everything. This means that you have to pay special attention to the type of insurance coverage that the patient has, as many patients may incorrectly believe that their medical insurance also covers dental procedures. On the other hand, if the patient does receive dental care that is related to a medical condition, then the medical insurance could be billed. For example, if the patient has an abscess of the gums, which is incised and drained in the office, then the procedure could be billed as either a dental procedure or a medical procedure. The dental (CDT) code for incision and drainage of abscess of the intraoral soft tissue is D7510, whereas the medical (CPT) code for the same procedure is 41800. This means that the patient can go to either their dental or medical office to receive the same treatment, but that different insurance companies would be billed. Unlike medical billing and coding, dentists are reluctant to outsource their billing and coding. This is typically because of the vast amount of first-hand knowledge needed to bill dental claims, as well as the large amount of medical records and other required attachments. An in-house biller and coder is an important part of making sure all claims are sent correctly the first time. Because of this, there are many opportunities for billers and coders to ease in to the dental billing and coding field, in an actual dental office setting. You can also get your certification in dental coding, just like a certification in medical coding, which makes you even more desirable to potential employers! Ultimately, dental billing and coding is very similar to medical billing and coding. You have to use a different coding text and put the codes on a different form, but the basics remain the same. Pay attention to correct coding techniques, practice compliant billing, and stay detail oriented!